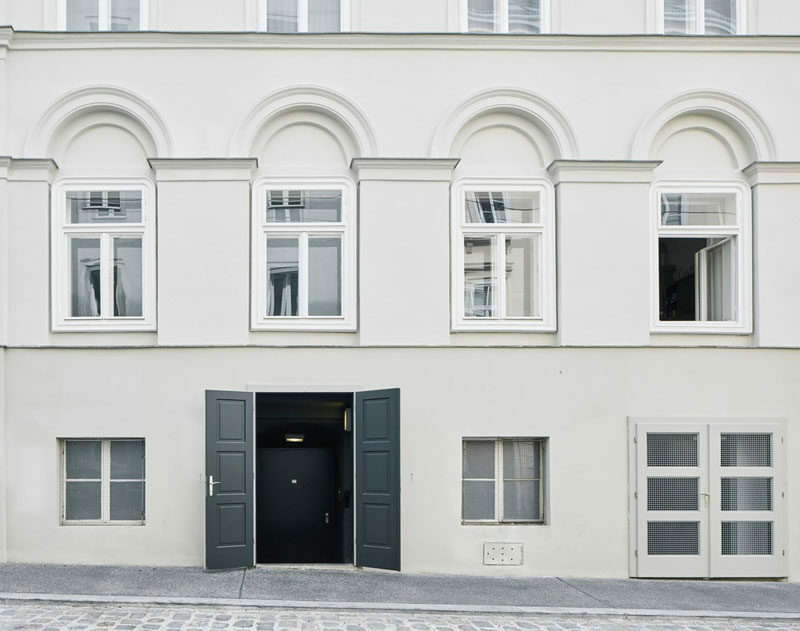 When this late 18th century building in Vienna, Austria, was being renovated, a bricked up staircase was found. That staircase led to a twelve meter deep (39 foot deep), second cellar area with approximately 250 square meters. After historical investigators looked into the building, they discovered that it had once been used as a semi-legal establishment in the 50’s and 60’s in an era of Vienna’s flourishing jazz scene represented by names as Joe Zawinul or Fatty George. 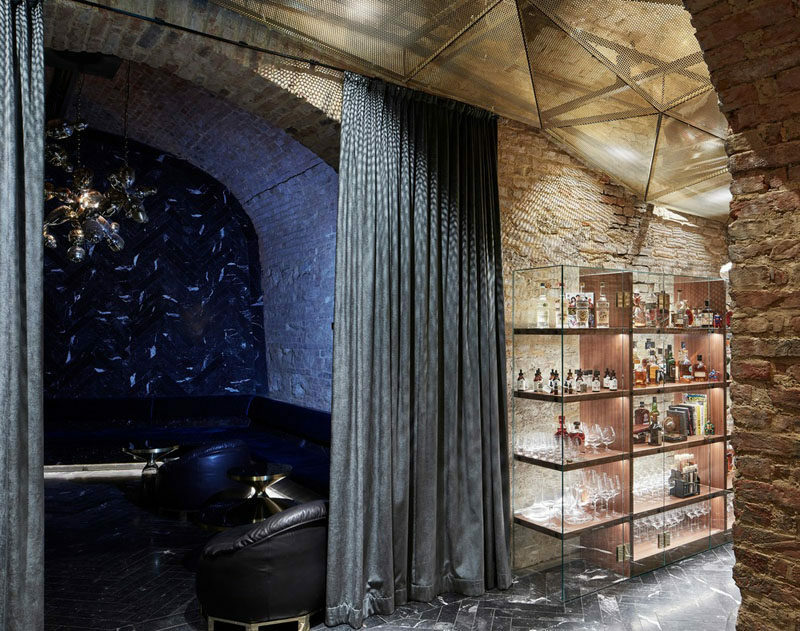 Commissioned by their client to bring the space back to life, architecture firm Büro KLK, set to work to transform the space into a contemporary underground cocktail bar. A narrow entrance door leads to the first basement level and gives glimpses of the original walls. 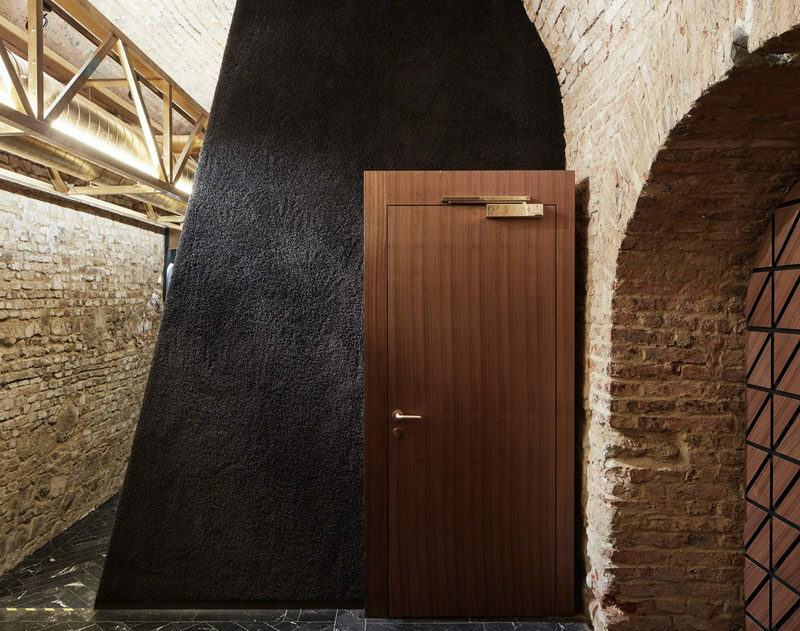 A wood staircase with lighting leads down another 7 meters (22 feet), where stone arches are revealed. 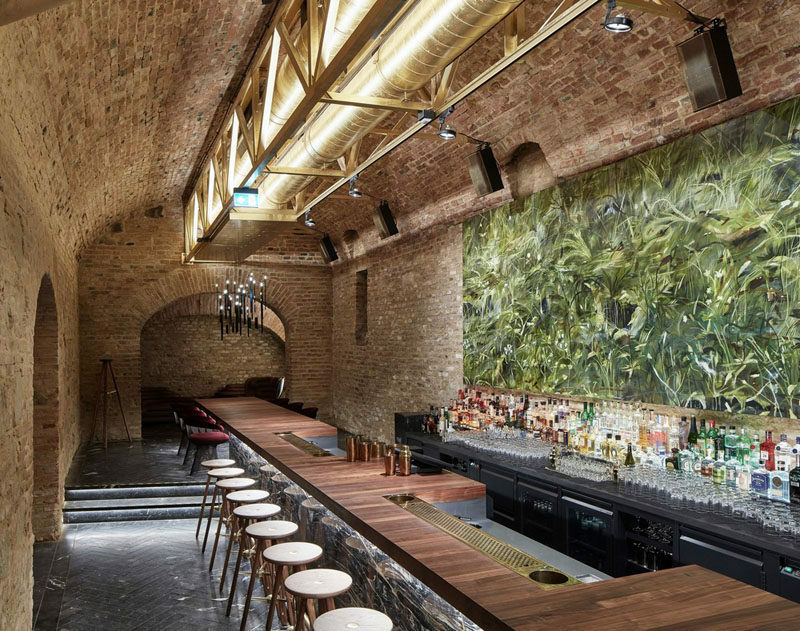 Throughout the interior of the bar there are several alcoves, a hidden booth, the smallest art gallery in Vienna and secret hallways that surround the center piece. In the bar area, all of the equipment and appliances are situated on a concrete floor plate and on load-bearing trussing which was directly generated from the engineering requirements. The ventilation pipes have been turned into an accent as they have been clad in composition gold. The concrete floor plate throughout the bar is covered with a layer of Italian nero marquina marble manually laid in a herringbone bond. The numerous alcoves have a variety of seating options for guests. 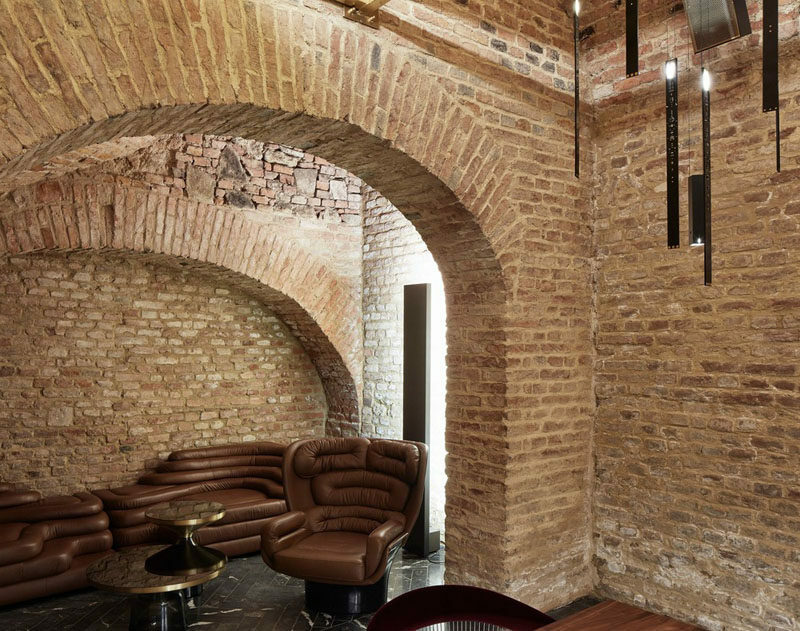 In this alcove, there’s a darkened room with dark leather couches hidden by curtains. There’s also more open spaces with comfortable brown couches and armchairs. 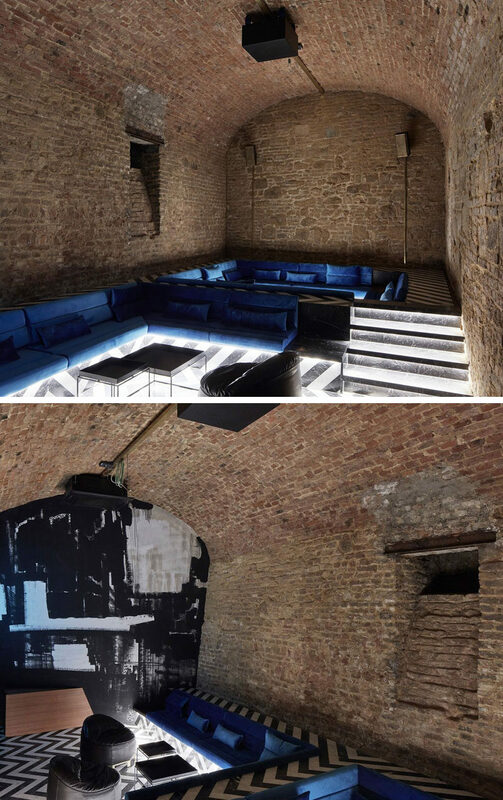 In another alcove, there’s a raised floor that allows for a sunken lounge with blue couches and hidden lighting. Wood doors with gold hardware compliment the wood stairs and the gold clad ventilation pipes.